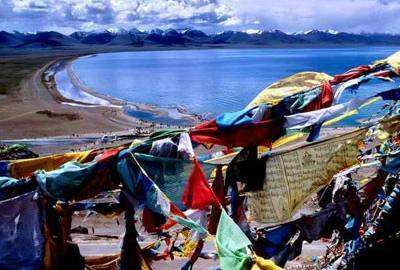 Tibet is rightly located at the center of Asia with a population of some 6 million people. This ancient trading center having an average altitude of 13,000 feet above sea level compasses an area of 2.5 million square kilometers. 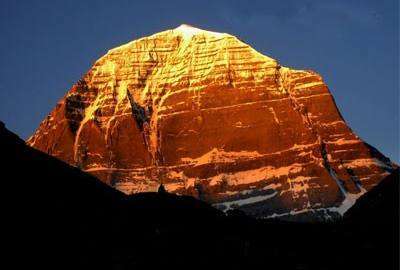 The earth's highest mountains, a vast arid plateau and great river valleys have associated Tibet to be the most sought tourist destination among the world. One who visited will be rewarding with its enriched culture and impressive natural beauty as a bonus. 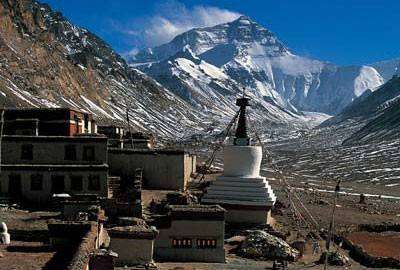 Wilderness Excursion operates Kathmandu Lhasa Overland Tour. For more information, please kindly write us and send your tour requirements with details such as group size, travel duration, arrival date etc. Day 01 :Join Kathmandu 1300m Arrive in Kathmandu and you will be received by our company representative and transferred to the selected hotel. And a short brief about your trip. Stay overnight in hotel in Kathmandu. Day 03 :Kathmandu — Zhangmu—Nyelam (3700) 160 km drive, about 6 hours on wheel Early morning, drive from Kathmandu to Nepal-Tibet border (Kodari). After finishing immigration formalities at Nepal side, our Tibetan guide at China side will pick you up at the border with the permit. And then, along the longest valley—Zhangmu valley in Tibet, you will continue drive up the steep switch back road to Nyelam town. Day 04 :Nyelam—Old Tingri –Lhatse (4200m) 260 km, about 6 hours on wheel After Lablung-La pass (5050m), the journey continues across the Tibetan plateau with fabulous peak view of Mt. Shishapangma (Alt.8012m). Old Tingri is an old town from which you can see Mt. Everest and Mt. Cho-Oyu, Afterwards, continue drive to Shegar. Day 05 :Lhatse—Syaka—Shigatse (3700m) 230 km, about 5 hours on wheel After breakfast, we set off for Shigatse, one of the most historically significant cities in Tibet. On the way, we visit Sakya Monastery which was built during the Yuan Dynasty when Syaka School dominated Tibet Buddhism. Syaka Monastery is reputed as the Second Dunhuang Grotto in China, the murals said to be the most beautiful in Tibet, and also in Syaka Monastery you can find the largest book written in gold at its Buddhism library. 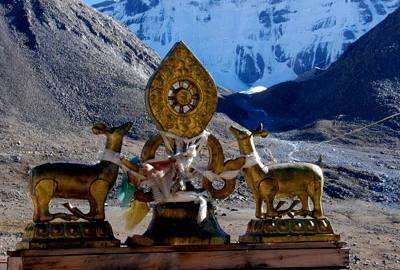 In the afternoon, visit Tashilumo Monastery which is the seat of Panchen Lama, the equally important religious figure in Tibet as Dalai Lama. 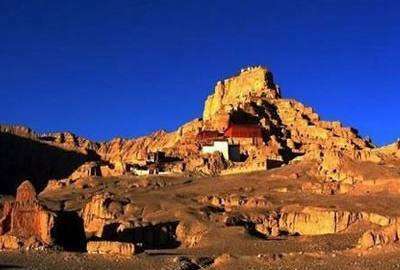 The monastery was built by the first Dalai Lama in 1447. Day 06 :Shigatse—Gyantse—Lhasa (3650m) 360 km, about 7 hours on wheel In the morning, drive to Gyantse, there you will visit the largest stupa in Tibet—Kumpa Stupa (Ten-thousand stupa), just next to the Stupa is the Pelchor Monastery (optional). Another important site in Gyantse is Dzong Castle which once was a battle field where Tibetan fought against British invasion. Afterwards, drive to the holy city Lhasa via Yamdrok Lake, according to local mythology, Yamdrok Lake is the transformation of a goddess, on the Gangbala Pass, you will have a clear picture of this Tibetan holy lake in turquoise, in distance you can also see the snow capped Summit of Ninjingkangsang. 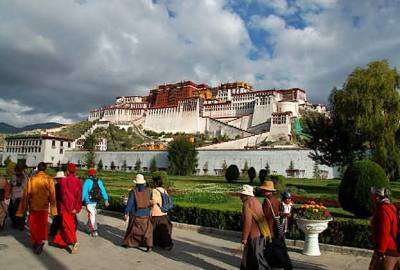 Day 07 :Lhasa Tour of the world heritages and Tibetan history In the morning, visit the symbol or landmark of Lhasa—Potala Palace, the successive Dalai Lama's winter residence. In the afternoon, visit the center of Tibetan Buddhism—Jorhkang Temple, where you will come across lots of devoted pilgrimages coming from every corner of Tibet. Both sites are under the list of the world cultural heritages by the UNISCO. Day 08 :Lhasa Sightseeing (Tour of the most important monasteries in Tibet) In the morning, we will visit Drepung Monastery which is the biggest Tibetan Buddhism College with the biggest number of monks in Tibet. The monastery used to be the winter residence of the Dalai Lama before the 5thDalai Lama moved his residency to the Potala Palace. And in the afternoon, we will visit another influential Gelugpa Monastery—Sera Monastery, where the largest scale of scripture debating among monks is famous all across Tibet. We will watch the debate session and you may join in too with the help your guide. 2 Nights deluxe bed room in 3/4/5 star hotel in Kathmandu on double occupancy..